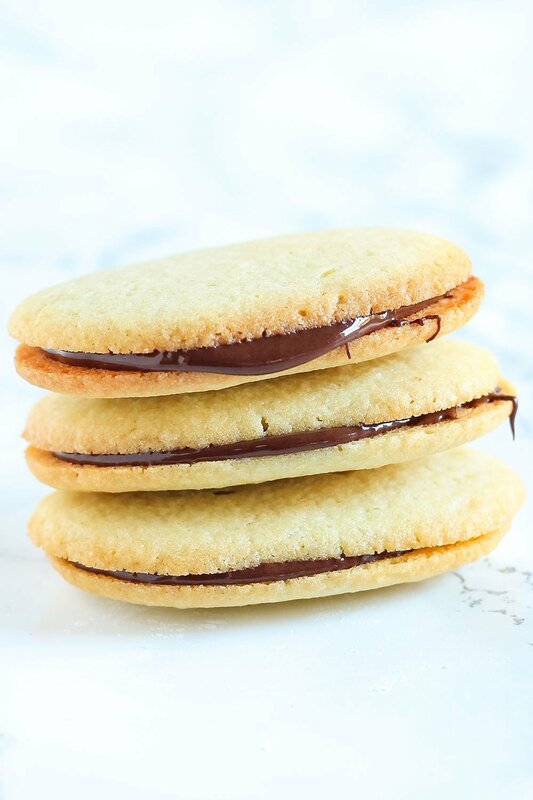 Impress your friends with these Homemade Milano Cookies! They're even better than store-bought and surprisingly simple to make. YUM. Taste: The cookies themselves are mildly sweet and pair beautifully with the semisweet chocolate filling. I added the option to make the mint layer if you wanted to take on refreshing Mint Milanos! Texture: The cookies are slightly crumbly with a little bite while the chocolate is super smooth. Ease: The assembly was probably the most hands on (and messy) part. An offset spatula makes it much easier! Appearance: Almost identical to the store-bought kind! Cons: A little messy, but I actually think making these might be fun with with your friends or your kids. Would I make this again? Yesssss. I don’t know what it is about taking something that is usually store-bought and turning into something homemade that just makes me so excited. I think it’s the challenge to see if I can make it just as good, or even better! I’ve done it before with these Homemade Fudge Rounds and these Hawaiian Bread Rolls. Now I won’t eat the store-bought versions!! If you ever have any special requests, be sure to send them my way! For these Homemade Milano Cookies, there are a few small and inexpensive tools that make them much easier. I like to use my Ateco plain tip and a disposable piping bag (I buy them in bulk for cheap on Amazon – so handy!) to pipe out uniform pieces of cookie dough so they look just like the regular Milanos after they’re baked. I also like to use a small offset spatula to spread the filling over the cookies. Lastly, jumbo paper cupcake/muffin liners are perfect for serving these so they really look like the packaged Milanos. It makes it so much more fun to say they’re homemade! *This post was originally published in 2016 and updated with weight measurements and a step-by-step video. In a medium bowl, using an electric mixture, beat the butter and granulated sugar on medium-high speed until light and fluffy. Add the vanilla and egg and beat to combine. With mixer on low, gradually add the flour and salt and beat until just combined. Transfer dough to a piping bag or zip-top bag. Fit the piping bag with a plain tip, or snip a 3/4-inch hole in one corner of the zip-top bag. Holding the bag at about a 90° angle, pipe cookies that are 2 1/2-inches long and at least 1 inch apart, onto two parchment-lined baking sheets. Chill until firm, 30 minutes. Preheat the oven to 325°F. Bake until cookies are light golden at edges, about 15 minutes, rotating sheets halfway through. Transfer to wire racks and let cool. Melt the chocolate in a glass bowl in the microwave for about 1 1/2 minutes, stirring every 30 seconds, until smooth. If desired, in another bowl whisk together confectioners’ sugar, peppermint extract and 3 to 4 teaspoons of water. With a small offset spatula, spread the melted chocolate on flat side of half the cookies and mint glaze on the other half (if using). Sandwich cookie halves together. Cookies can be stored in an airtight container up to 5 days. i would do just about anything for a milano cookie… these are too cute! Yes! I can't tell you how many time we are in a store and the kids are begging for some packaged treat and I tell them “No way am I paying $4.00 for something I can make for far less AND healthier!”. Mean mama I am! On that note: I've never had a Milano cookie but they do look delicious! I have (in over 80 years) never had a Milano cookie, but my curiosity has been aroused and I will rectify that error even if I have to go out and buy some. Hi Tessa, these look amazing! Could you please do a recipe for raspberry Milanos? Here in South Africa we do not have Milanos…..but I guess now we will, because I’m gonna make ’em! Yeah! They do look delicous and just the kinda cookie I adore….so guess what I’m going to be doing this weekend!!! This is the best version I have ever seen. I think a butter rum extract version would be to die for!! Thank you, Tessa! I received your email for these cookies and immediately went to my kitchen. Wow what a great recipe. I left some plain, joined some with chocolate and the rest with chocolate and mint , just divine, thank you. Hi Tessa.. I love ur recipes.. I wanna ask, can I try these cookies in a microwave?? No, they need to be baked in an oven. Please! How do you get these flat (thin) & round?? Yum! Your Milano cookies look so good. I don’t allow myself to buy the ones in the store often because I want to eat them all. I don’t have any unsalted butter in my country. No one likes it. Only the salted one (however, i only use same brand butter). What should i do? How am i supposed to use the salted butter in each recipe if there is no salt at all in the written recipe? And even if there is, what am i supposed to do? Skip the salt as the butter already has it? One question, you didn’t mention the size of milano cookies while piping. I piped a few and the were standing upright, about one inch…then they fell down which made two of the cookies sort of join together while baking. The cookies were done in 12 mins (I guessed it by the golden edges which were now turning brown). My dad says i should’ve cooked for more time till the “cookie was deep-ish brown on the edges”. They taste delicious. Gave a slight bite but were a bit soft on the inside and just a tiny bit chewy. What is the texture i am looking for when it comes to milano cookies? I never ate homemade cookie so… Should I cook it for 15min or it depends on the size and golden edges? Your recipie looks amazing. I am going to make it, but i don’t have a parchment paper. Is it okay if i bake it without the paper by lightly greasing the pan? I never grease the pan when I bake cookies because it can cause them to spread more. Do you have a Silpat or anything else? Really great taste. However, the instructions are a little unclear as to how thick to make the cookies. I also found that it didn’t work to pipe the dough through a plastic bag–the dough for this recipe is too thick and popped the bag quickly. These look delicious! I have a few questions though. Some recipes mix heavy cream with the chocolate. How do you think this affects it? Also, some recipes make use of powdered sugar instead of granulated sugar. Does this make a difference? And lastly (hehe), does using white eggs instead of the whole egg make a difference? I saw other recipes using just white eggs. Hehe i can’t wait to hear back! It’s much easier, less messy, and more uniform if you pipe the chocolate onto the cookies. Thank you for all the yummy recipes and beautiful pictures you’ve posted. I was looking over some of your recipes and I have a question about the ratios posted. I always use a scale and weigh when baking and not use the American cups measuring system. And I’ve noticed some inconsistencies in the weights/cups you’ve provided in your recipes. 1 stick of butter is normally 113-115 grams, but above has stated 133g. 2/3 cup of granulated sugar is 135g, which you have 132g above, which is very close. 1-1/4 cups of AP flour is 175g, but you have 159g. I assume a couple of the weight differentials are probably typos, but I just wanted to double check with you if you normally make your recipes with the US cups to bake or do you usually use a scale to weigh everything? I needed to know to make sure which ingredients weight I should be following. I’ve checked in multiple websites, sources and tested myself on the ingredients conversions, I’m fairly sure what I have is correct. If i’m not, please feel free to correct me. Thank you very much! Hi Tessa! I was wondering if you could use brown sugar instead of granulated to make the cookies. Thanks! Hi Jo, no unfortunately they won’t quite be like Milano Cookies if you make that change. Yay so excited to try these! I recently gave up Milano cookies because they contain Palm Oil 🙁 These look like the perfect replacement! Hi Tessa, I watched your video & love the milano cookie recipe and am anxious to try it. You make it look so easy & you take the time to show all the steps for making the recipe and the finished product. Thank you so much & I’m looking forward to checking out more of your recipes. Love Milano cookies, unfortunately for me, they are a bit sweet. Know with this recipe I can adjust the sugar or add a different type of sweetener. Thank you so much for this and all the other recipes.